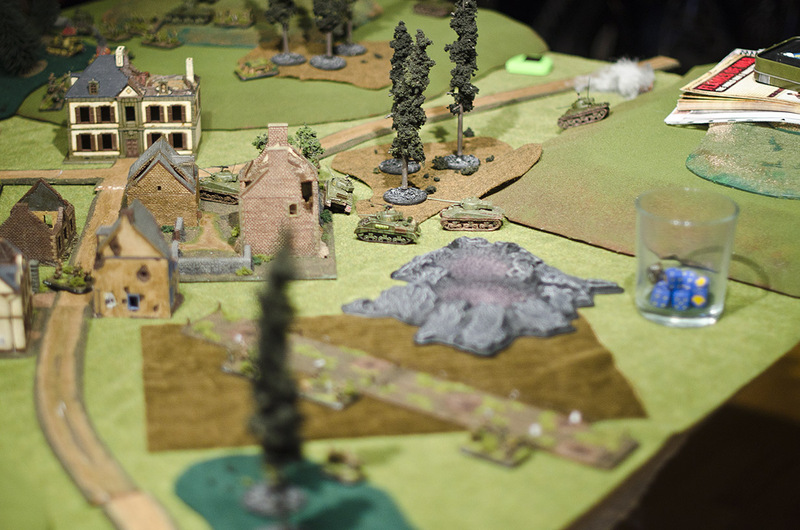 I had a game of FoW with my buddy last weekend. I had planned to photograph the game and write a report, but I got too busy machine-gunning Nazis and forgot to take pics. So, here are a few views of the battle, at the two points in the game when I remembered to shoot pics. The scenario was Breakthrough, with me playing Canadian 4th Armoured and my friend playing an infantry company of the 2nd SS Panzer Division. These are all my minis and terrain. SS deployed on the hill, guarding the objectives. 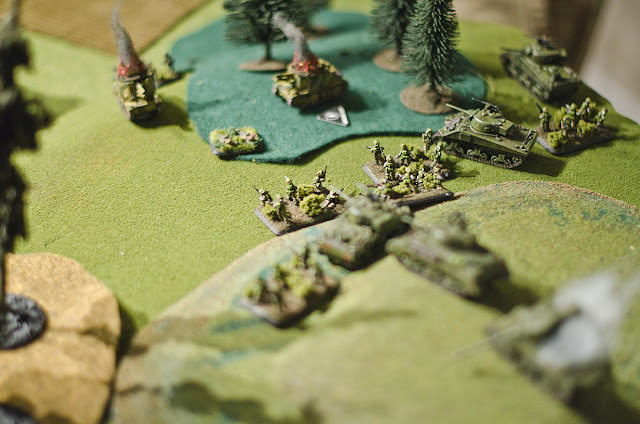 PaKs on the right, a platoon of infantry behind a minefield in the midground, with Shermans of the Canadian 4th Armoured sort-of visible beyond. A better view of the Shermans. On the hill behind them is the company 2iC, and on the hill behind him (just out of frame) is one of the OP Shermans. SS PaKs. 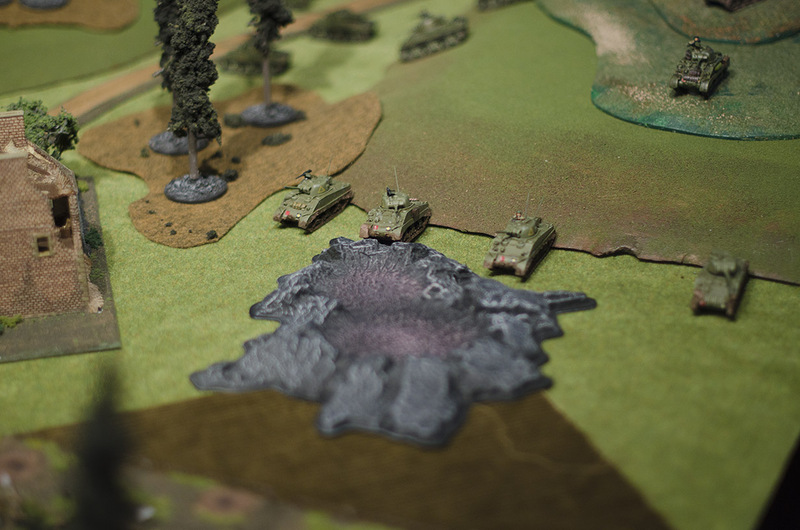 These guys were deployed to cover the objectives, but I was able to keep my tanks out of their LOS for the whole game, so they were pretty ineffective. 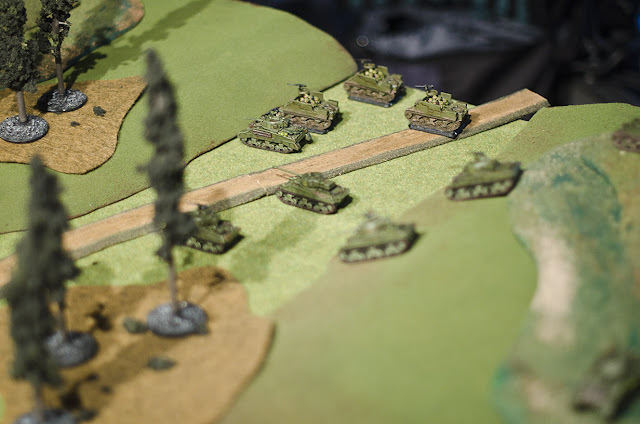 The other Sherman platoon advances across the draw towards the other SS infantry platoon and the Grilles. 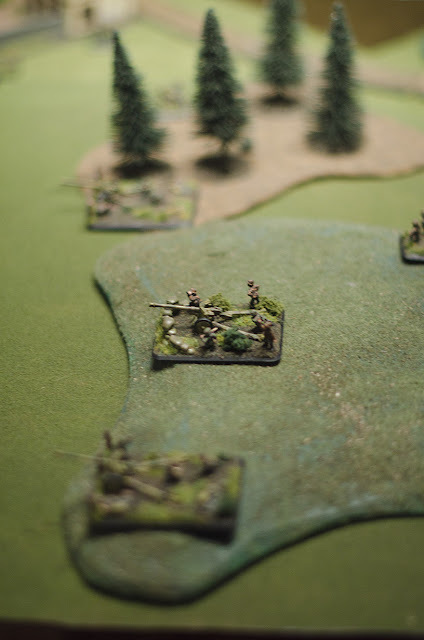 The one Canadian infantry platoon in my force sneaks along the edge of the board in Defrocked Priest Kangaroos. One of the Grilles supporting the SS infantry. This one bogged the first time it tried to move and died without firing a shot. 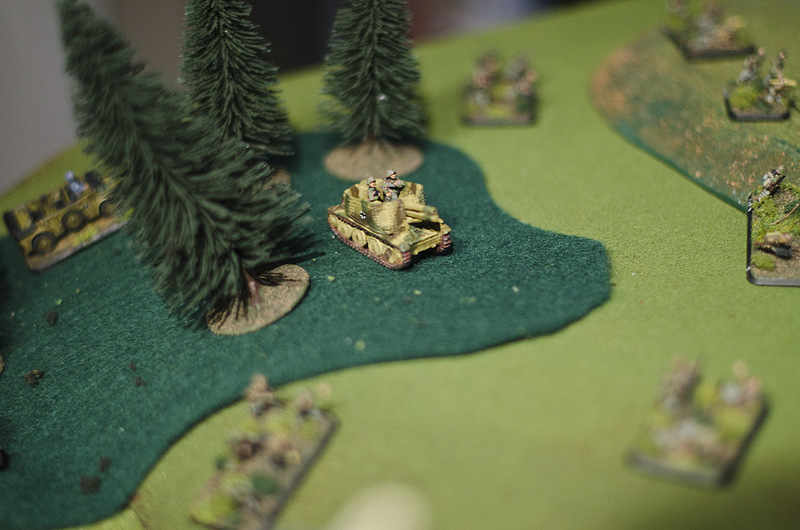 The other one got off a single round and burned a Sherman Firefly, but got killed by return fire. 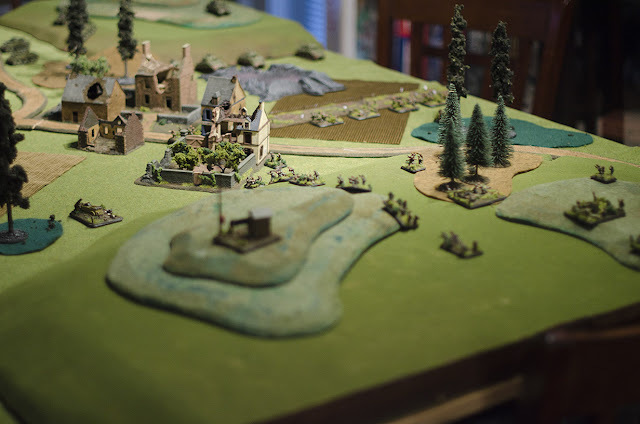 Looking from the Canadians' board edge, we can see two burning Grilles, a burning Firefly, and not much SS Infantry... at this point, they had been mostly wiped out on this side. Meanwhile, my delayed-reserve Stuarts and Wasps were wreaking lumberjack havoc at the objectives, and the other Sherman platoon had wiped out the Luftwaffe-crewed 88s (super guns, but terrible crews) so the SS conceded. Chalk one up for the good guys!